Rattlebones is a game about transforming dice. You start with standard six-sided dice, and throughout the course of the game you can remove sides and replace them with other sides that let you do all sorts of wonderful things. Every time you score points, you get closer to finding Rattlebones and, er, winning the game. Yes, winning! It’s an experience to six-sided-die for! – Place the Rattlebones meeple at 55, 60, or 65 VP space (for 2-4 players). Players each get 3 d6 (black, white, gray) — basic d6 but the ‘1’ is replaced by Rattlebones. – Place random tiles on the empty spaces on the board. 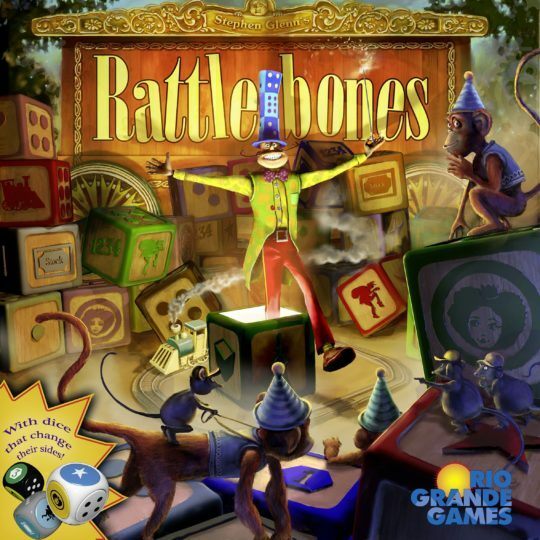 – if Rattlebones shows, move Rattlebones back one space; game ends immediately if it hits a player score marker and most points wins. – if pips or Rattlebones showing, move one of your pawns clockwise that many spaces (RB=1) and use the space you land on. Typically, you may add a die face matching that space to the die you used (replace any face except Rattlebones). – otherwise, take whatever action the face allows (e.g., earn a stock marker or star token, which you may later turn in for VP; earn VP; steal stuff from other people; etc. ).